I'm actually laughing at myself! What have I got into? Trying to make dumplings?? Well, I have seen my late grandmother make them a long time ago. I can remember the ingredients but not the measurements! So, it took me about two hours to come up with the perfect recipes, and I'm glad I did! It was an instant hit! They were all gone, all gobbled up! Make the dough first, add about 480 to 500g of all-purpose flour with 300ml of water. Knead the dough and let it rest. You should be able to make 40 dumplings with the dough. Meanwhile, prepare the filling for the dumplings. Click here for the dumpling wrappers video. This is an updated post with a new photo and video cooking guide. Place 2 tsp of the filling in the center of dough, fold and shape. Steam the dumplings for about 8 to 10 minutes on high heat. Pan fry the dumplings with 1 Tbsp of oil over a medium heat. Then add 3 Tbsp of water and simmer for another 3 minutes. Serve the dumplings with mixture of 4 Tbsp Soy Sauce, 2 Tbsp Vinegar, 1 Tbsp Roasted Sesame Oil and some chopped Scallions. 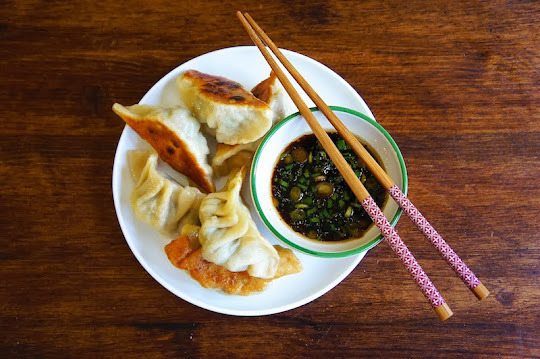 I've been looking for a tasty pot sticker recipe and stumbled upon this dumpling recipe. YUMMY! These look absolutely perfect- nice job! I swear...This time I will try to do...because I love dumplings nahm nham nham!!! This blog is very nice, congratulations!! I would like to invite you to see my food blog, I have a translater if you need ok.
Nice recipe! I am lazy and fry the dumplings first, then add water to the fry pan and a tight lid to steam them. It saves me washing 2 pans. Hi! I'm from KC, Mo, and have never made dumplings. So, I watched a YouTube Instructional Vid. Am about to start making. Wish me luck! I have only made dumplings once with a slightly different method. I like steaming then pan frying how you did; they seem to be a bit more crisper. They look delicious! I am so impressed that you made the dumpling dough from scratch. These look fabulous! Wow, I think my b/f would love these!! And for myself I would make a vegetarian version! Very nice recipe, and mouthwatering photos!! I LOVE homemade dumplings! I make them at home all the time now. I want to try your recipe! Yum! I made these the other night and they were wonderful! I was able to get over 50 dumplings out of this dough using about 1 inch balls (before rolling them out). This was my first time making these and I found this recipe to be simple and great. They are of course a bit time consing but well worth the wait. I love dumplings, they bring back so many childhood memories.